Open Studio: We write, right? We write, right? is a web-based journal, since 2015 essays and texts by artists are published on the website. Andrea Fraser did it, as well as Daniel Buren or the Situationists. They combined visual artworks with texts. Artists coming from the field of music, fine arts and performative arts compose manifestos, they themselves take sovereignty of interpretation into their hands, reflect on their own works or articulate their thoughts on socio-political topics. 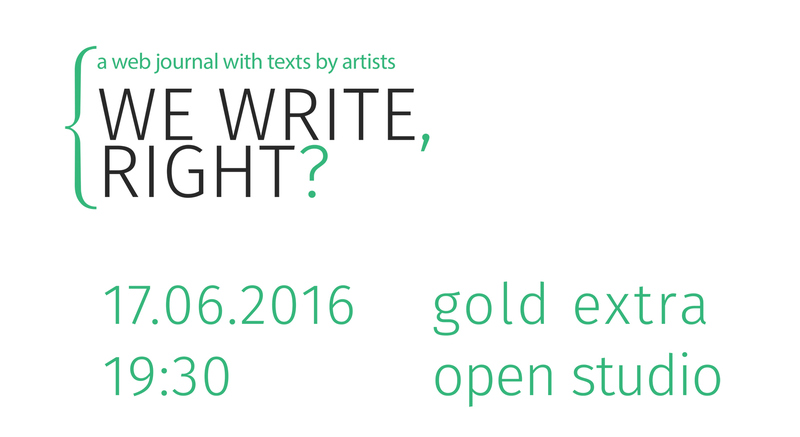 This edition of gold extra’s open studio is dedicated to texts by (mostly fine) artists. How does writing influence, help or bring further artistic production? How do artists see their role when writing? What formats do they choose, prefer or introduce when writing texts? What is the impact of their writing on the art world and our understanding of art? Doris Prlić and Sonja Prlić devote this evening to writing artists and present the works published in the web-journal.